Within a fortnight of relocating back to Australia we were in my happy place – the Yarra Valley. In the short time since my last visit a number of new businesses have popped up in Healesville including the new cellar door and distillery for Four Pillars Gin and an excellent place to grab an evening meal, the Herd restaurant and café. The Innocent Bystander cellar door is a staple in our itinerary as is the Yarra Valley Dairy, not only for their amazing cheeses but also for the tastings they host. On this visit to the Dairy we were treated to tastings with Nathan Reeves from Out of Step Wine Co. and Dave Macintosh from Arfion. First up was an incredible value-for-money new release from the team at Innocent Bystander, led by Chief Winemaker, Steve Flamsteed. The Wild Run white and red wines are easy drinking field blends perfect for any gathering when you want your guests to have something tasty in their glasses without breaking the bank. When you can take it away from the cellar door for $10 AUD a bottle in a pack of 6 or $15 a single bottle, it’s hard to pass up. The Wild Run Field Blend 2014 is a white wine made from grapes sourced in McLaren Vale and dominated by Rhône varieties such as Viognier, Roussanne and Marsanne. The wine gets off to a good start with floral aromas of honeysuckle and jasmine and a good dose of fruit – pear, apple, white peach and a touch of melon. This is nicely balanced by herbaceous notes of fresh grass – rather unappetising as fresh grass may sound, it is a good counterbalance to the fruit. On the palate these flavours follow through from the aromas with a nice kick of spice (white pepper) on the finish to complement the appealing richness in the texture and mouthwatering acidity. The Wild Run Red is equally quaffable. With Shiraz, Cabernet Sauvignon and a bit of Pinot Noir together in the glass there is just the right amount of black fruit and savoury spice to suit most red wine drinkers. The fruit is juicy and the acidity levels keep the wine from being heavy and fruit dominated. Priced the same as the white blend, we left with a case of each! 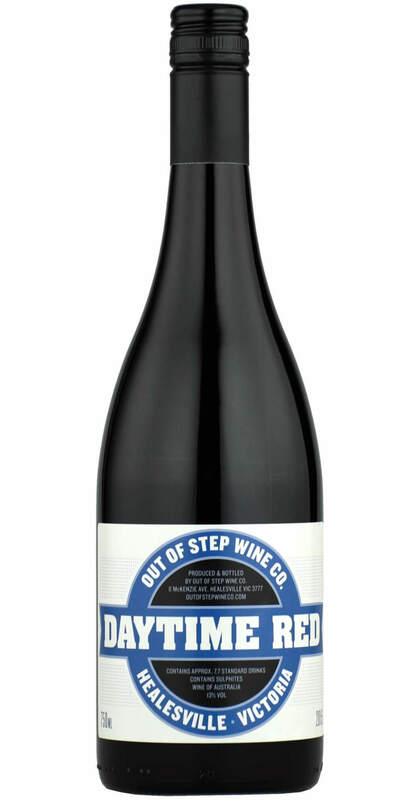 Next up is the Daytime Red from Out of Step Wine Co. This is a lighter style red that benefits from being served lightly chilled. It has a little bit of everything in the blend giving it fresh and herbal notes together with savoury charcuterie aromas and flavours. The production technique, I’m told, also uses a little bit of everything – “… a few small batches of wine, a bit of stems, some co-fermentation, a bit of carbonic, and leave a barrel or two unsulphured and untopped, with the vision of putting these pieces together”. Dave Chatfield, one half of Out of Step, also tells me the whites were skin fermented. More importantly, this adds up to an eminently drinkable wine that is positively delicious and perfect for a summer evening. The final wine in this trio of producers is made by Dave Macintosh of Arfion. This is the first release of the Spring Pinot and I hope it is not the last. It’s an easy wine to drink with its enticing ruby shot with violet colour. It is best served lightly chilled and comes in at 12% abv with black fruit, floral and herbaceous aromas. The fruit has a sweet note to it telling of the carbonic maceration used during production and this is nicely offset by herbal raspberry leaf and forest floor notes on a good length finish. It is made in a nouveau style and intended to be drunk early and fresh – and I am doing just that. (Lamentably I am down to my final bottle!) Looking back at the note for this wine I wrote “light, juicy and enjoyable”. What more could you want?